This Second Helpings project is a combination of two mediums I’ve talked about in past posts — acid etch for glass, and porcelaine paint for use on dishes. There is a Pebeo paint which is made especially for glass and it does not need to be fired in the oven, however if you are planning to use it on glassware you intend to drink out of and wash and use again I would recommend you take the extra step to ensure its permanence. The Pebeo paint for glass is called Pebeo Vitrea 160 and it is also water based and comes in both opaque and transparent colors. For this project I etched the glass first. On the lighter green bottle with the round ornaments I just painted the acid etch in swooshes leaving lots of untouched bottle for painting the ornaments later. On the darker green bottle I cut out squares of plastic contact paper in the shapes of presents and stuck them to the bottle. 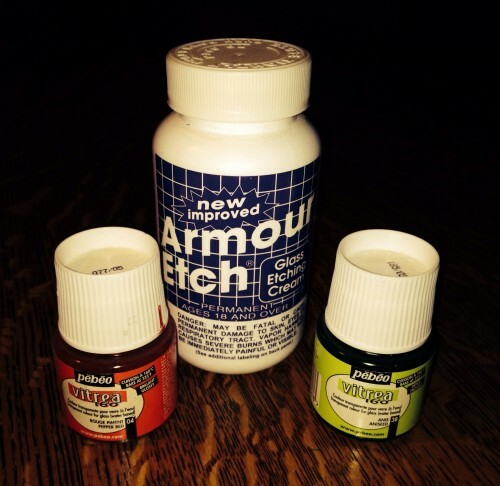 I then covered the entire bottle with the acid etch cream and let it do its work. When I rinsed it off there were present shaped “windows” where the contact paper had been and I painted presents in some, but not all, of those spaces. 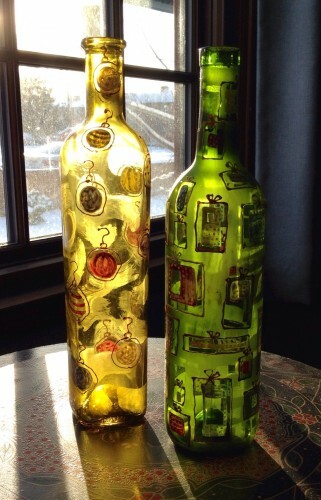 There are lots of cool things to do with the finished bottles. You can simply admire your handiwork with the sun coming through them. You can put in various spouts and use them for oil and vinegar, or dishwashing liquid. 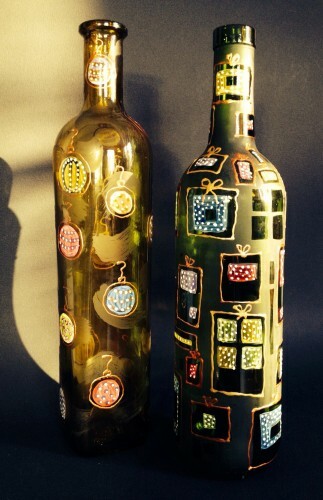 You can turn them into oil lamps with kits available at craft or candle stores. 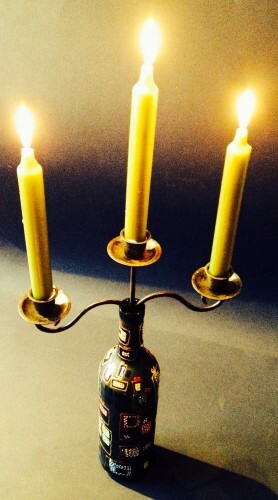 Or you can add little candelabra inserts like this one, which was a gift to me. 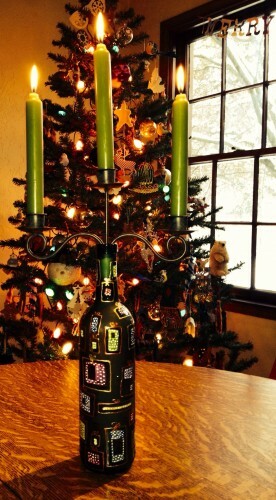 Now if only Hans Christian Anderson had had a little more imagination he might have introduced the Little Match Girl to a nice Wino and together they might have come up with something more festive, like this….